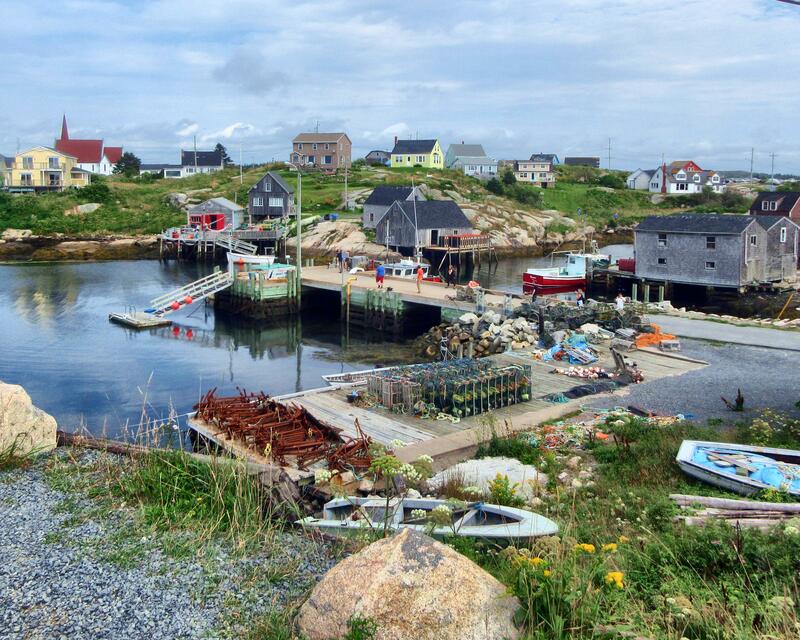 Peggy’s Cove is one of those impossibly photogenic places. 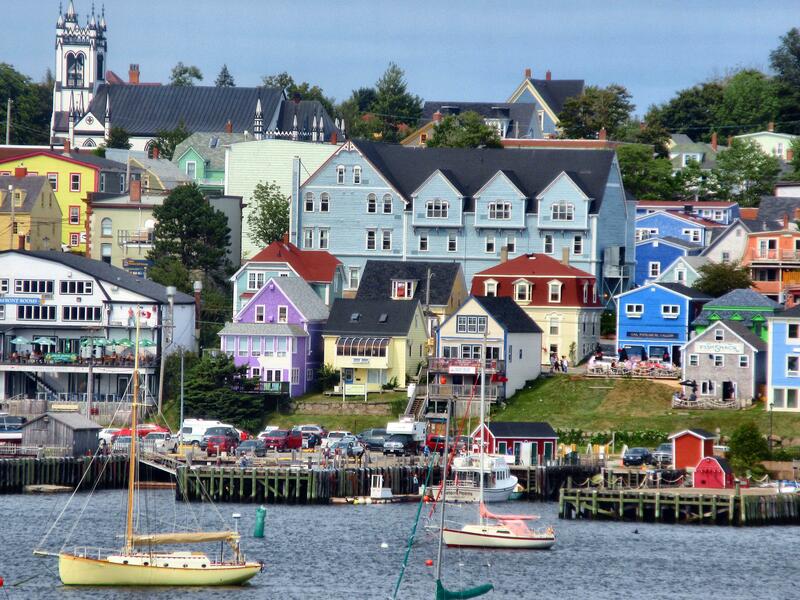 You know the type–quaint clapboard houses nestled on the rocky shore, weathered boats snugged up against the dock, colourful buoys and netting lying carelessly on the ground. I picture the townsfolk rising each morning and hurrying to stage the area before the tourists hordes arrive. It’s a working town I’m told. All those boats ply the sea for a living. 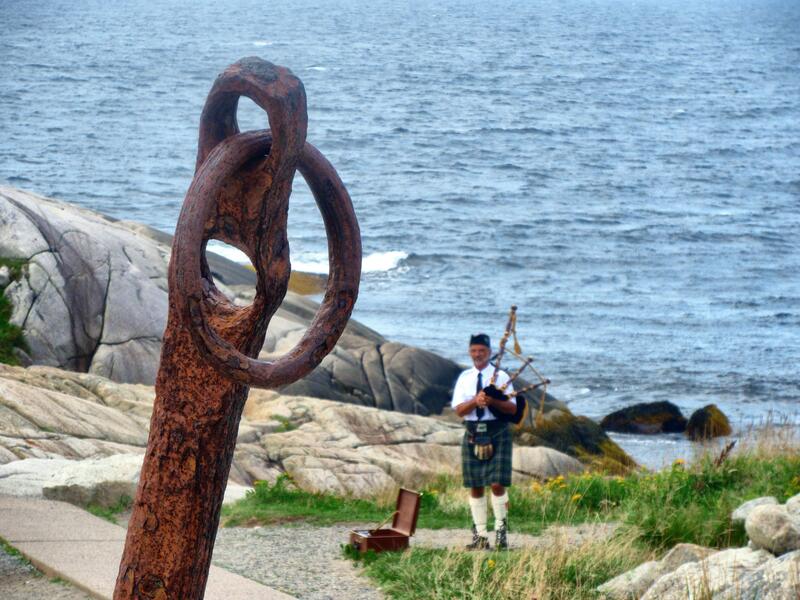 Forget the twee shops with Peggy’s Cove paraphernalia, the folks who live here year-round can’t survive on the tourist trade. 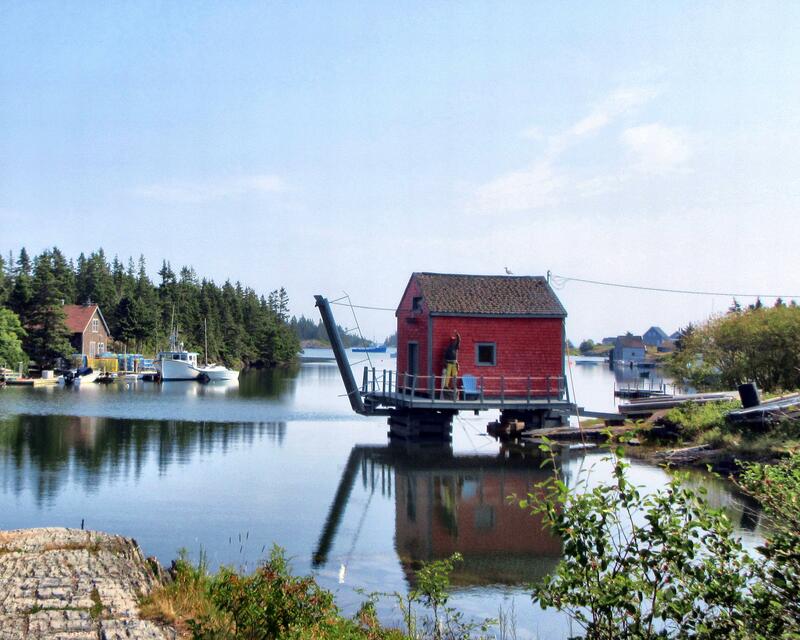 They fish and live in tiny little houses heated by heaps of wood you see surrounding most places in Nova Scotia. 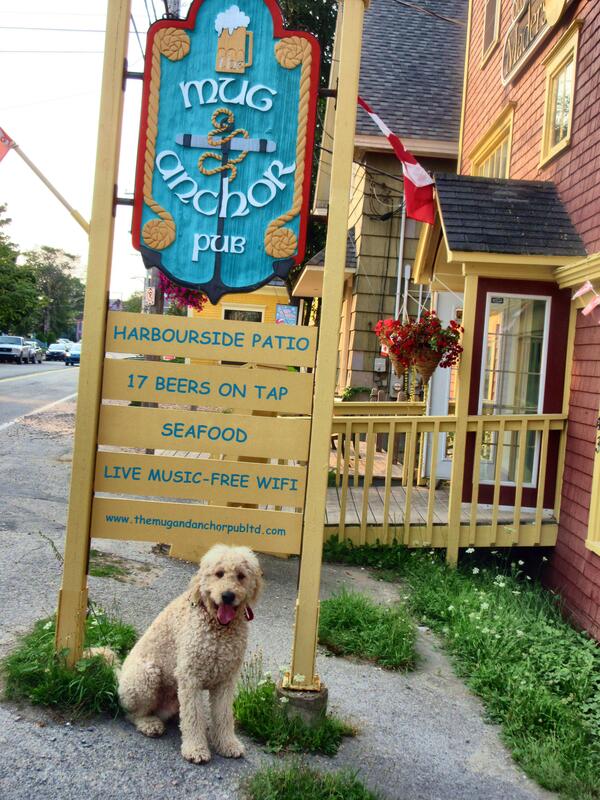 As we circumnavigate we run into yet another picturesque village, Yawn…..
We end up in Lunenburg, which, sorry Peggy, has our vote for the most photogenic town we’ve seen. It’s also on the UNESCO heritage list. (Take that Peggy!) Oh, and it’s home to the Bluenose II, that iconic, multi-sailed wooden racing yacht on the Canuck dime. 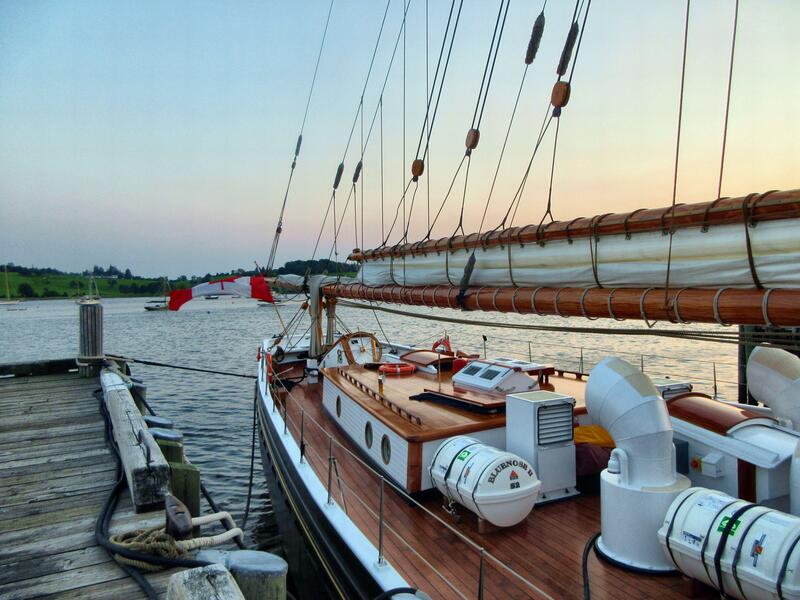 The original was built and launched from Lunenburg in 1921. The problem with horses is they have needs that can’t wait. 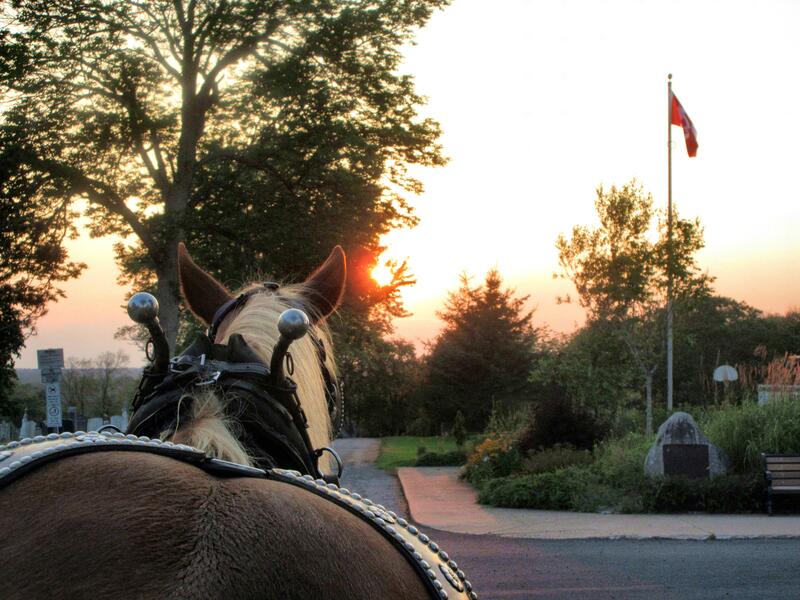 Our sojourn is delayed as George, our good- natured equine engine, feels the earth move, so to speak, and plops down a steaming mound of recycled hay as our group of six giggles in the carriage behind him. A further delay ensues as our human guide whips out a shovel and black garbage bag to hide the evidence. Load lightened we move on, past former sea captains houses topped with widow’s walks, where fretting wives would gaze out to sea waiting for the ships to come home. George patiently clomps up and down the streets, so used to the route that he automatically stops at a large water barrel placed in case he needs a pick me up. Lunenburgians take the UNESCO label seriously. Houses in designated areas have plaques that outline the pedigree of the home–who lived there, what they did for a living and the year the house was built. The circa 1700s houses, with their brilliant colours, impeccable trim and window treatments, shamefully look better than the Meanderer’s circa 1980’s abode. 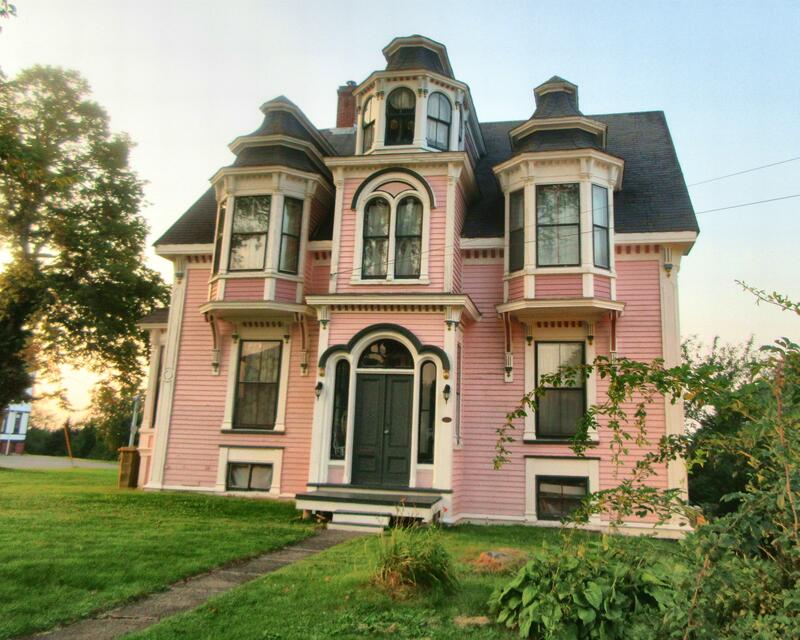 The only designation our Kaleden house is getting is least likely to be sold by a drive-by. 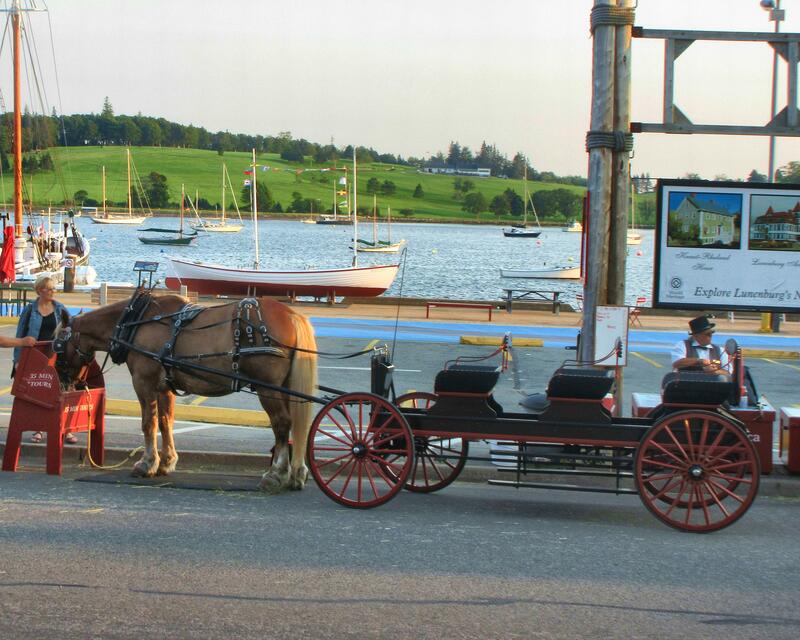 Lunenburg golf course beckons from across the Bay. An interesting course if you like hitting balls blindly over hills while waiting for golfers from other tees to hit across your fairway. The one lane track leading to the course makes for an interesting game of chicken on the way to the clubhouse. The views of town across the bay make up for the inconvenience. Oh, and it has a cannon on the course in case we get attacked on the ninth hole. Taking our leave , we head around the coast and make a side trip to Shelburne, settled by British Loyalists after the American Revolution, along with a large contingent of blacks who fled the U.S. in search of a better life Surprise, surprise, the land they were given was sub-standard to that given to white Loyalists. Gorged with dairy, we finish the day in Yarmouth, not to be confused with Dartmouth which is across the Bay from Halifax. 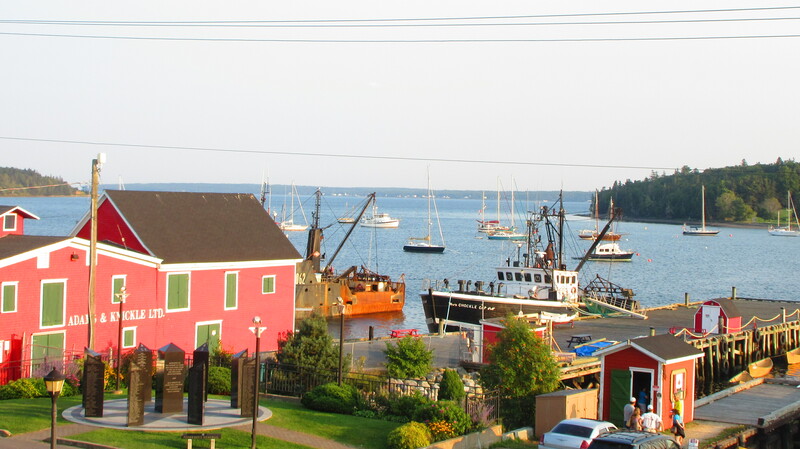 Yarmouth’s claim to fame is lobster fishing and a ferry to Maine. 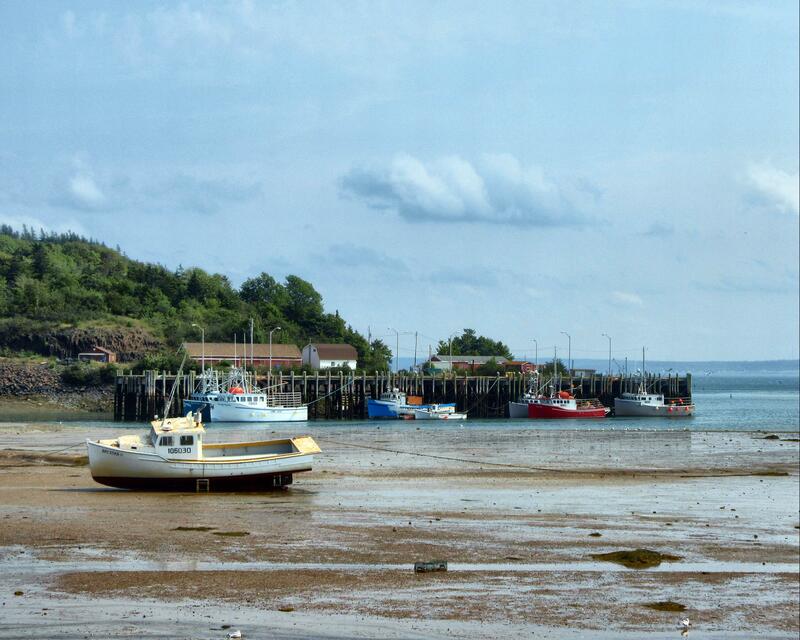 The Dude’s insatiable appetite for all things scallop, leads us to Digby, self-proclaimed scallop capital of Canada. 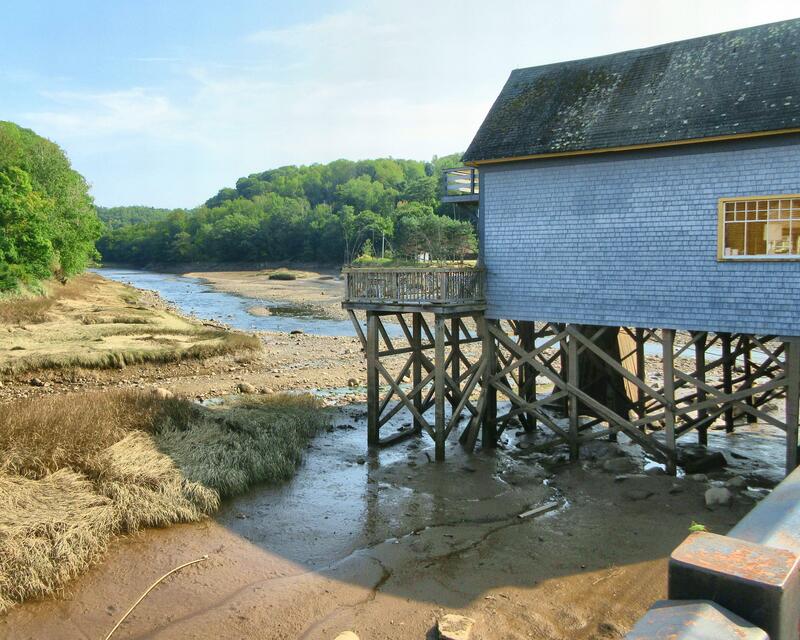 It’s also the gateway to the Bay of Fundy, of the aforementioned tides of doom. 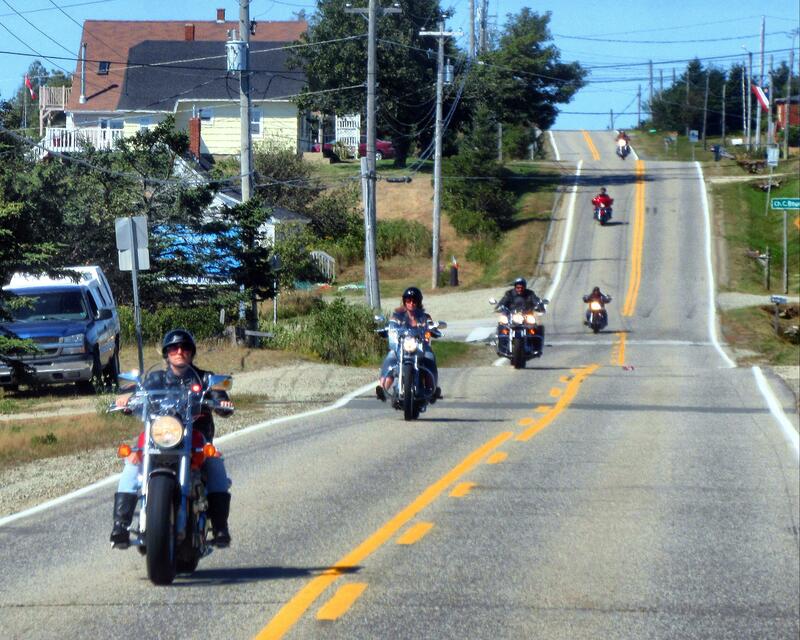 We arrive at the end of the long weekend and the Wharf Rat Rally, Canada’s answer to Sturgess, a massive mélange of motorcycle enthusiasts billed as Canada’s largest two-wheeled party. Given the number of bikes we passed on our way in, it lived up to its billing. Boomers with expensive topped out Harleys, trikers with grandma on the back, serious bearded riders with sleeve tats, posers with sleek foreign bikes, designer sunglasses and harness boots and biker club wannabee’s, leather jackets emblazoned with logos vaguely hinting at a Sons of Anarchy vibe, roared past on their way back to civilian life. 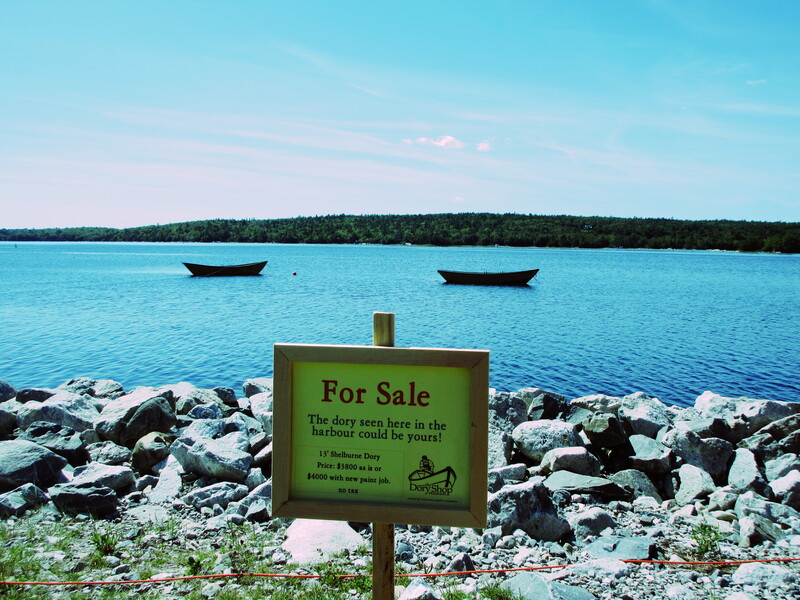 Digby campground overlooks a peninsula where we get our first look at the impact of the tides here. Every six hours the tide goes out leaving a barren landscape of sand and waterlogged plants. How anything survives in the salt water is amazing. A day trip down the peninsula to Brier Island gives us a taste of the fickleness of coastal weather. We start out in a mixed bag of cloud and sun and end up at the ferry to the island in a thick pea soup fog and temperature drop of over 10 degrees. Turning tail we head back to Digby. The Dude, who has never met a nap he didn’t like to take, decides to sit out a day trip to Annapolis Royal, which is fine with The Dog, who has never met a car ride he didn’t want to take. Our first leg of the day trip is a photo-op at the Point Prim lighthouse, which in my mind is secondary to the wild rock formations which surround the place. Photos snapped, sniffing and leg-lifting over (for The Dog, to be clear) we head up coast to Annapolis. Of all the cities/towns we’ve visited with military backgrounds, this town has the historic cred. Attacked thirteen times throughout its tumultuous history, it has morphed into a peaceful quaint little town. The remnants of Fort Anne and its earthen walls are all that remains. Oh and the cannons, can’t forget the cannons. 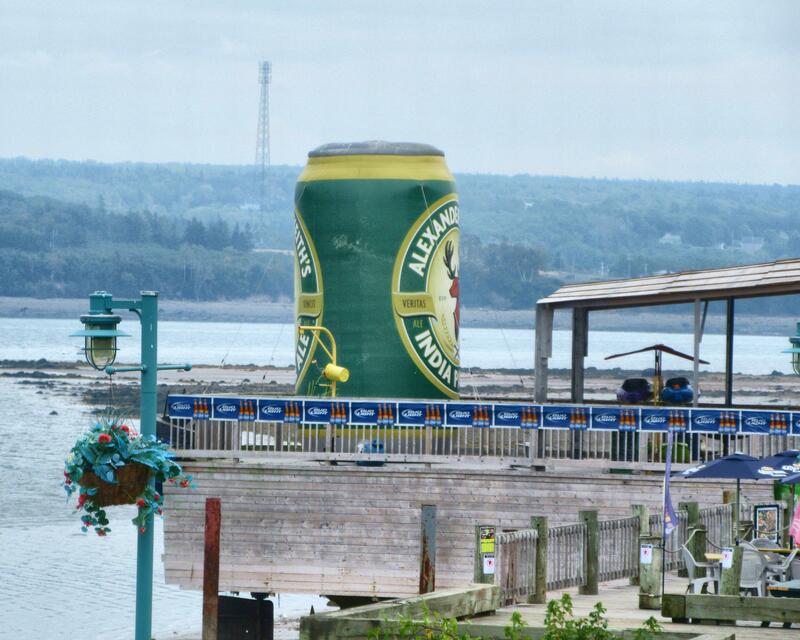 Next….The real Bay of Fundy and the Incident…. You must be loving NS. I did when I was there many years ago. You’re seeing all the sites I did. You didn’t mention Ft. Louisburg. Was that on purpose? I read all your blogs and really enjoy them. Many things you mention, I didn’t know either. However, much I did. We’re having the most exceptional Autumn. Our last croquet game was Thanksgiving Sunday. Our mini-league was last Wednesday. Tim and I were — not good. I can’t remember if we won a game all season. Joyce & Bev, however, are the new “ringers”, Dave is his normal self. Can’t remember what is happening on the return run. We have 2 new players. Kathy and Rick — future enthusiasts. You’ll like them. Lots of fun. Meanwhile, Dave thinks you may be heading South soon. He wants to let you know about the deal called “America the Beautiful”. It’s their “national” park pass and costs $80.00 US for a full year from the date you purchase it. But, it includes way more than parks. If you are going to any of the canyons in Utah or Arizona on the way back, you will more than save the fee. Grand Canyon alone is $50.00. Here is the web site: http://www.recreation.gov/pass. Hey croquet buddies, yes we did go to Ft. Louisburg, but the day was pouring rain and cold (reminding us of BC coastal weather) so we chickened out and headed back to the wheeled homestead. Thanks for the info, I knew Dave would have a cost-saving tip for us…miss you guys as well, can’t wait to get back on the field of green next year!